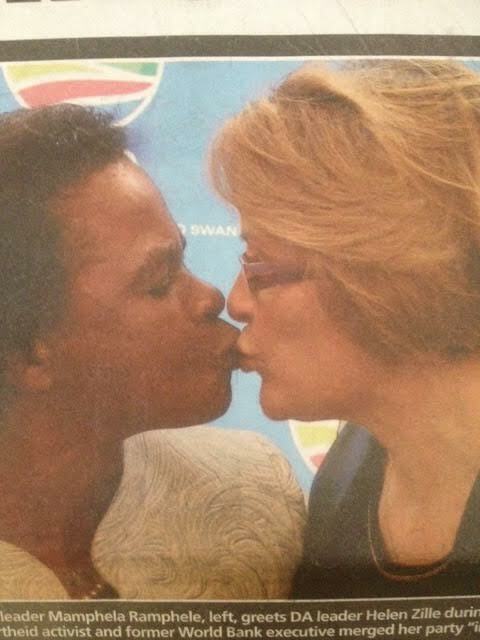 Zille & Ramphele: The KISS that left more than a betrayal smudge! It is all in a kiss, be it love or betrayal ! Through generations and times, a kiss was used to convey affection, love, friendship, peace, and unity. Equally, a kiss was used the night of the betrayal of Jesus Christ as the sign for his detractors. We have seen how disgraced leaders in full view would embrace and kiss their partners as a sign of unity after infidelity was confirmed, despite the known true reality of the hell behind closed doors. This week was one of drama for some unsuspecting Mzantsites who decried the mess of ‘unification’ of claimed two parties or the blatant renting of a ‘black’ academic turned politician. In the hullabaloo of denials early on Monday and the Tuesday huddled press conference jointly attended by Dr. Ramphele and DA Leader and Western Cape Premier Helen Zille, some are left in proverbial sixes and sevens to make of this matrimony of convenience in election pact signet. I like many have shared my views a long time ago on Dr. Ramphele as it was carried in an earlier article captured in February 2013 of the Citypress “Inside a flawed political ambitious mind.” Yet I thought perhaps I could opine on the actual kiss that was blazoned on the news media purporting to be the ultimate sign of the ‘unity’ of Agang- SA and the DA. The kiss thus has a dubious and multi-layered meaning depending what society, time, and situation one finds oneself. This week Ramphele and Zille kissed in unity of a ‘black’ presidential candidacy for a ‘white’ party. It is time to ask what this kiss meant. This kiss, for Ramphele was a kiss of betrayal to an Agang-SA she informed the world and all who wanted to hear is the answer for ANC opposition. The same Ramphele opined the DA was a ‘white’ party who can never articulate or speak on behalf of what is commonly termed ‘black’ people. It was a kiss in betrayal of those who for a variety of reasons found Ramphele what the claimed a fresh breath and new entrant self-made and need no one’s money. It was a betrayal to the staff compliment of Agang-SA who was clearly shell-shocked by this announcement as they were readying for an elections showdown as promised by its leader. Ramphele’s kiss with Zille was also a betrayal of ideology. Yet this ideology aspect in my assessment is perhaps not true because Ramphele though in extramarital relation -association of a Black Consciousness icon Steve Biko has not practiced these strong BC ideological principles. For the greater part of her post – Apartheid context, Ramphele has proven very comfortable in the various positions she held in dictate of a liberalist conviction. Ramphele betrayed some who considered her perhaps wrongly the hope of the black middle class. Mamphela betrayed Biko’s famous ‘black’ unit construct philosophy. Ramphele also betrayed herself because it appears one cannot take her morning and evening talks but with a cup of salt. She betrayed some who considered her as an academic astute and above this political muck of personalities and self-interest. Helen in her persistent and obsessed need to unseat the ANC had political one-night stands, dates, flings, and some courtships with a variety of personalities from a crossbreed of SA political and labour context. She portends forever in love with anything and everyone that says something bad of the ANC. Helen has politically bedded the dead ID of a once vocal Patricia De Lille, until she chained De Lille into a silence with a Mayoral Chain rendering the ID into brief existence but a long death. Hats off – to Helen Zille for knowing how to take them down in which she remains the male dominant one. She had a proposed date with the now suspended COSATU representative Zwelinzima Vavi that came out when Vavi told all how he was pursued by a feisty Zille. She flirted with Mosioua Lekota of COPE, until their competing ego’s killed the fling. Zille may have had some politically speaking one – nightstands with a Kenneth Meshoe of the ACDP and with Bantu Holomisa of the UDM but these were brief ones. Yet Helen kissed in this season Ramphele, in what I shall call a kiss of betrayal on her part for she betrayed the ultra-conservative DA members who came to the DA as a fall out of and old NP remnant. Zille betrayed the organisation’s policy context in letting an outside person be proposed for the DA’s presidential contest. She betrayed a growing group of internal unhappy constituency with her leadership who sees her latest half cooked quick to media press conference as in defiance of the DA stance. Zille, in her kiss betrayed even those who are considered liberal, for liberality is not naturally translating to an absence of conservatism. The DA cannot claim it was ready for this surprise of a ‘black’ leader as Helen sprung this on them. It is therefore not correct to assume that all the so-called liberals agree with a Ramphele as DA presidential candidate. Helen on lighter note potentially betrayed South African males, confirming an undying obsession to show female dominance over males as her Western Cape cabinet attests. Helen Zille with this barely kiss, also betrayed Ramphele, for the truth is knowing that the DA will never have the seat of president in SA constituency, it is an easy offering thing to a megalomaniac Goggo who hallucinates of a place and time in Tuynhuis as president of SA. She offers Mamphela literally a moment in the sun of claim of face on ballot paper in the only true opposition fold, but nothing more than that because come June 2014 Ramphele will be an ordinary DA member with a record of accomplishment of failure as evidence and sign of no future. Helen betrayed, her own protégé and crowned successor, Lindiwe Mazibuko . The truth is the young Mazibuko was never an option she was a decoy of youth claim, whom Helen Zille preferred at a time when she needed to deal with some in the DA who were challenging her base and leadership. Mazibuko has therefore outlived her stay and served her “purpose” you could see that with all the mess of policy confusion caused by her ineptness. Also because Mmusi Maimane is a much more complete DA future leader than her. Ramphele gives Helen a chance to fix the wrong of Mazibuko appointment. My unsolicited advice to Lindiwe go back to university and study further girl! It is time we acknowledge Zille’s uncanny knack to attempt greatness in SA political platform. Her moves are all in self-sustaining almost intoxicated to unseat the ANC regardless who she must flirt with, when and where even how. Lastly, Helen betrayed herself for she acknowledged that she would never qualify to be the SA president for who she is and for what she can bring. She with this last stroke of bedding told SA the DA still believes in fronting when every law in democracy convulses at the thought of such. Helen’s lips met Mamphela’s lips in a sanitised embrace of kiss in which hardly the make-up smudged, but the betrayal proved real. Perhaps this kiss was rehearsed, perhaps this kiss is a more true reflection of what this charade of potential political prostitution dictates, for it is no semblance of unity as we are told in abuse of Mandela legacy, it is the calculated and callous desires of two politicians who have betrayed their parties and themselves. In the end, it appears the famous song ….Let’s just kiss and say goodbye… of the Manhattans that vintage soul-train voice group, will be the song cometh the hour after the 2014 elections results are announced. Until then the stench of betrayal pollutes our political canvas attesting a sanitised kiss that left an indelible betrayal smudge.